April, 6, 1978 to ? This is a picture of the building that was used for Leroy's Sports book and the Saratoga Club. The building was torn down when it was purchased by the Golden Nugget. Thanks to Twoleaf for his permission to use his photo from Flickr. 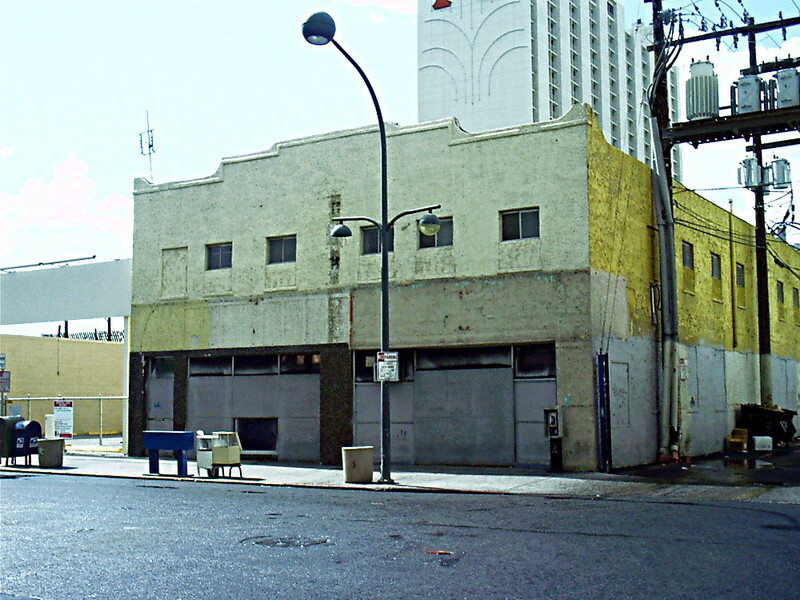 From a comment on his Flickr page, "In the movie "Casino", Joe Pesci walks into this building which was a sportsbook and confronts a bookie before threatening him and taking his money." According to a Wikipedia article, Leroy's was founded by Leroy Merillat. It started as an independent betting parlor in a strip mall in downtown Las Vegas. Vic Salerno, Merillat's son-in-law, took over in 1978. It is now the Largest operator of sports books in Nevada with over 77 locations. The Fuller Index gives a 144 S. 1st address for the 1978 opening. The collectible matchbook above has an address of 114 S. 1St. 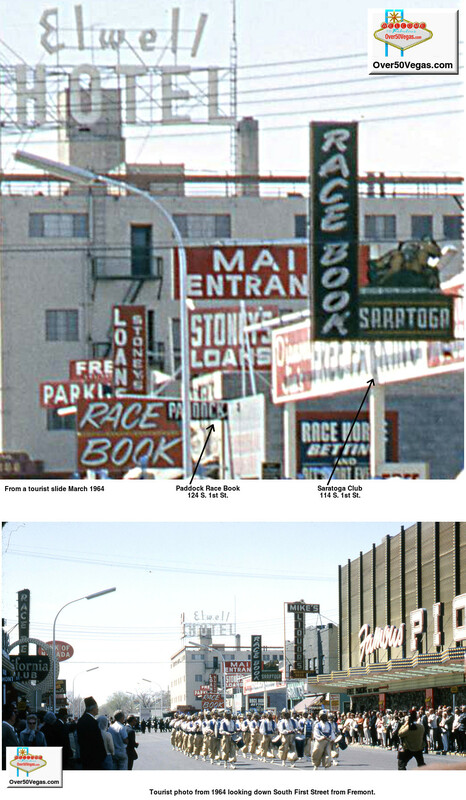 In this tourist photo from 1964 looking down South First Street from Fremont you can see the Hotel Elwell at 200 S. 1st, Mike’s Liquors, Saratoga Club at 114 S. 1st St., the Paddock Race Book at 124 S. 1st, and the South First Street entrances for the California Club and the Famous Pioneer Club. In 1953, after working at the Desert Inn, Golden Nugget and Pioneer Club, Mel Exber opened the Saratoga Sports Book on South First Street with Jackie Gaughan. At some point the Saratoga Club became Frank's Saratoga Club and then (or before) Sunny's Saratoga. I haven't found any dates or information on Frank or Sunny. 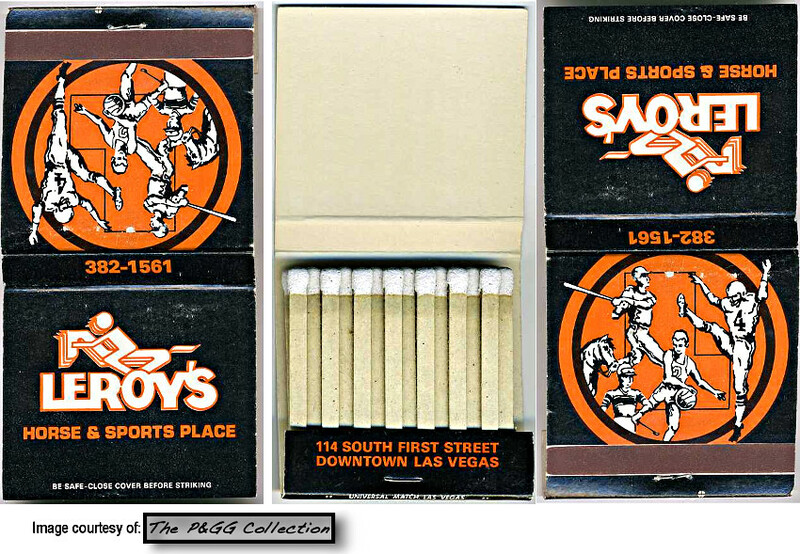 Front strike matchbooks, like the Sunny's book to the left, couldn't be manufactured after 1973. However, manufacturers were allowed to sell off the inventory they had on hand so front strikes were being distributed as late as 1978.